"Grassland," by T.S. 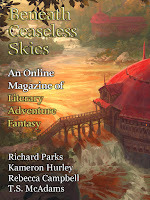 McAdams (edited by Scott H. Andrews), appeared in Beneath Ceaseless Skies issue 235, published on September 21, 2017. Pro: There’s quite a complex storyline here! Piecing the clues together, we see that Marcus is 29 and the year is 1878. Ajax was killed 5 years previously, when Marcus was 24. Ajax was only 17 when he ran away with 11-year-old Marcus in 1860. The Old West setting with people worshiping pagan gods is interesting, and some of the scenes (e.g. fighting the vampire) are loaded with tension. Con: Once Marcus finds the idol of Mithras, the story fizzles. The big conflict with Silas and the others appears to be for no reason other than pure meanness on their part, and the way Breed sacrifices himself to blow them away doesn’t seem due to anything Marcus did nor does it further any goal Marcus might have other than staying alive. Interesting world building, but the story itself was a bit rambling.